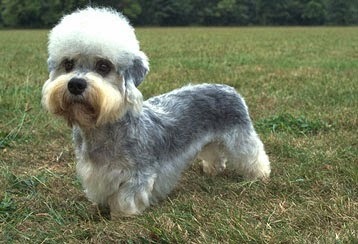 The Dandie Dinmont Terrier stems from the hills between Scotland and England. It was recorded as a distinct breed around the year 1700 and has been popular in all walks of life ever since. These dogs were originally used for hunting otters and badgers, and some of the hunting instinct remains - they can be trained coexist with cats, but might very well hunt smaller pets. They make great company dogs and can adapt to living in a city apartment as well as in the countryside. Dandie Dinmonts are known for being intelligent, independent, brave, and confident. The average Dandie Dinmont is affectionate towards the family and good with older children. They're fairly small and usually weigh between 18 and 24 lbs, but have the demeanor of a much larger dog. Since the dog has such a long back, children as well as adults should be taught not to lift it - and how to lift it when necessary. All dogs should be handled gently, but breeds with long backs are prone to disc problems. Dandie Dinmonts don't really shed, but they require recent brushing, and the coat should be stripped once a year. They have moderate exercise needs and will be content with daily walks and play sessions. With a name like that, the breed has to come from England! I agree - no other nation would name a breed Dandie Dinmont, LOL!